Considering getting a Cornish Rex? The Cornish Rex may not be the fastest of domestic felines but it has been called the Greyhound of cats. Its elegant and sleek appearance, as well as its galloping gait when it runs, explains how it earned its moniker. Active, playful, and affectionate, this kitty has dog-like traits and a mischievous streak. It is a wonderful addition to families seeking such a sociable and intelligent pet and can keep up with its boundless energy. Are you up for owning a Cornish Rex? Here is a brief background of this Greyhound-looking cat which was named after the Rex rabbit. The Cornish Rex may be reminiscent of the ancient Oriental breeds but it is actually a relatively new addition to the cat world. In 1950, a British Shorthair owned by Cornwall, England resident Nina Ennismore gave birth to a litter of kittens. One was rather different than the rest as it was orange and white and, most importantly, curly. It later developed big ears and a body that resembled that of a Greyhound. The unusual kitty was named Kallibunker. It was later determined by a geneticist that the kitten’s look was due to a genetic mutation. He recommended that Ennismore breed it with his mother to produce a litter of similar-looking kitties. Ennismore followed through and produced more curly-coated kittens. 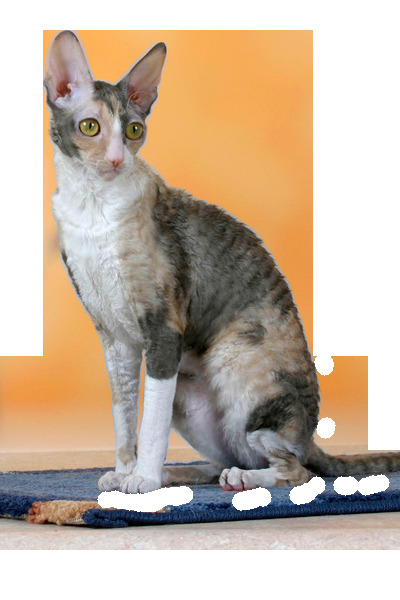 She named the new breed the Cornish Rex after the curly-haired Rex bunnies she bred and the place of origin. It was later discovered by scientists that the curly coat was due to a recessive mutation of a gene responsible for hair development. As such, Cornish Rex kittens only emerge when two such cats that are very closely related are paired. In the late 1960s, the Cornish Rex was acknowledged by the Governing Council of the Cat Fancy (GCCF). It has since been outcrossed with other breeds, such as Russian Blue, Siamese, and Burmese, to improve its development and health. The elegant and expressive Cornish Rex is small- to medium-sized. It has been compared to a Greyhound as it has a similarly arched back, tucked abdomen, very small waist, and long legs. This feline has a wedge-shaped head that is about a third longer compared to its width. Its cheekbones are high and its muzzle rounded. It has large, bat-like ears that are rounded at the tips. The eyes of this kitty are oval-shaped, medium-sized, and slightly slanted, thus adding to its exotic looks. Its sleek body is moderately long and is muscular, with a curved back and fine tail. Its legs are also slender and very long, making it appear tall. Its feet are small and oval-shaped. The hallmark of the Cornish Rex is its curly coat. The curly trait is not limited to its fur. Its eyebrows and whiskers are also wavy. However, this kitty does not have an outer protective layer. As such, it is more sensitive to temperature than other breeds. Its coat is also very soft. It has been said that it is one of the softest cats to pet. It can come in various colours and patterns. Is a Cornish Rex hypoallergenic? Whilst no cat is hypoallergenic, some breeds produce less of the Fel d 1 protein that triggers allergies in humans. 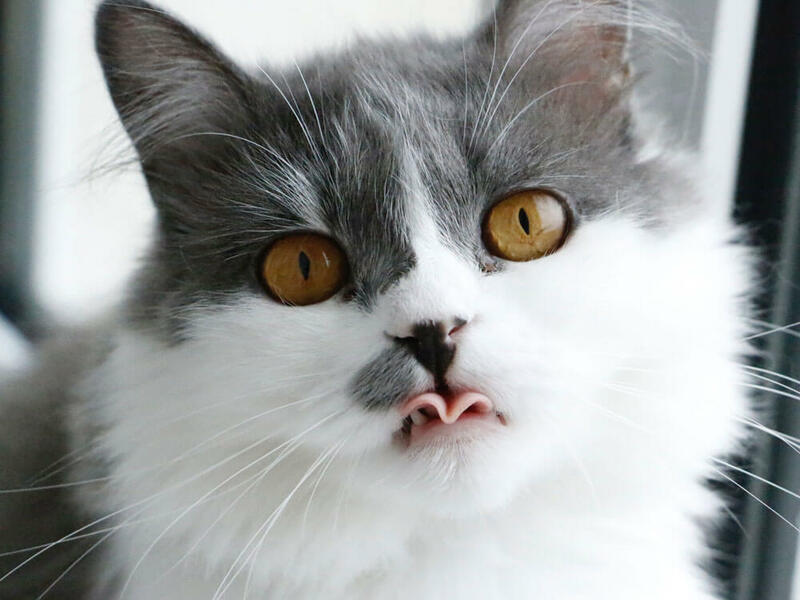 This feline is not one of those, though. Grooming this fine pet involves weekly baths, especially if it is ageing and cannot reach certain areas anymore. This is because it lacks the outer coat that usually absorbs the cat’s natural oils. In between baths, this kitty can be groomed using just the hands. The Cornish Rex personality is active, outgoing, and playful. Despite its aristocratic looks, its temperament is very similar to that of canines. It likes to retrieve items and play with a ball with its front paws. It loves attention and seeks it, engaging in humorous antics just to get noticed and praised. It also tends to develop strong bonds with its humans and wants to be in their company constantly. As such, it does not like to be left alone for long periods. Agile and athletic, this energetic feline likes to observe the world below from high places. As such, it is likely to climb various areas of the home. Its keen intelligence also makes this kitty constantly seek things to occupy itself with. It can be kept busy with puzzle toys or taught tricks. The Rex also tends to vocalise much as it likes to make get its point across every now and then. When it is feeling the cold, it will seek heat sources to keep itself warm. As such, it may sometimes settle on its owner’s lap to be cosy. The Cornish Rex should be provided with a nutritious diet that fulfils its daily requirements. It should be consistently given the same food following the same feeding times. If there are changes to its diet, those must be done gradually to prevent digestive problems. The serving portions should depend on the Rex’s weight, age, and activity level. Its meals must include at least 25% protein and just 5% carbohydrates. As an intelligent feline, the Rex should be mentally stimulated to keep it balanced and happy. It should be protected from the cold during winter season and the heat during the warmer months as it is temperature sensitive. It can get sunburn when exposed to direct sunlight for a length of time. A well-bred Cornish Rex for sale will cost anywhere between £300 and £500. Average insurance expenses would cost £16 (basic) or £25 (lifetime) monthly. Food costs may range from £15-£20 each month. For vaccinations, boosters, annual checks and other veterinary costs, pet care costs may add up to more than £500 each year. On average, a Cornish Rex owner will spend about £30-£50 per month. The insurance costs can also affect this estimate. For its entire lifetime (12-16 years), the expenses can be as low as £4,320 to as high as £9,600 overall. This estimate does not include the initial costs incurred in acquiring this cat. Is a Cornish Rex Right for You? This fine feline may have a very short coat but it is not hypoallergenic. It is friendly and good with children, making it a suitable family pet. The Cornish Rex seeks attention and can be demanding of it. As such, it is likely to succumb to separation anxiety when left alone for long periods. It is temperature sensitive and may get sunburns when left out too long. Its short coat is easy to groom; a brush is not even required.